Jill Of All Trades: 'My money book' for a happy life! 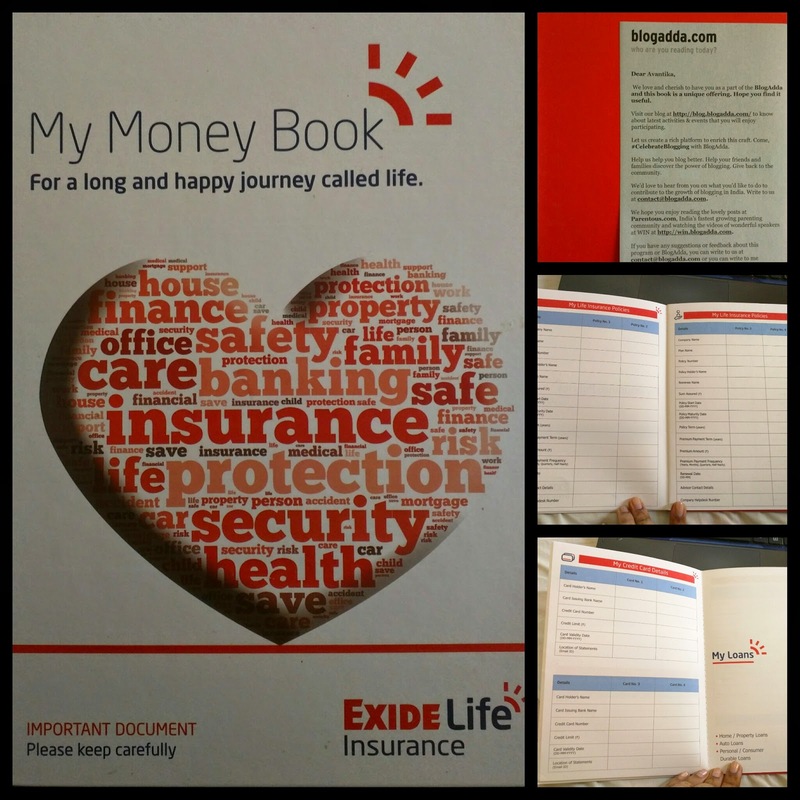 When I first heard about Exide Life's "My Money Book", I thought it was going to be a book about how to save, invest, etc. A guide of sorts or giving information etc. Little did I know that it is a diary where you can organize and record all your banking and investment related details! So no more hunting different files and folders, emails or documents. All your important information in one confidential book, of-course, which you keep very safely! So basically it helps me stay organized, is useful when I most need it and is easy and simple! It really couldn't get any better! It first starts with your personal information along with family's basic information, like any other diary or organizer would ask you do put it. Next you enter your Insurance Policies - Life insurance, Health Insurance, Motor Insurance and Property Insurance. It is very well thought and details - asking for all the details that I would ever need - Policy number, nominee, sum assured, maturity date, premium amount and even company's helpline number. A record of bank account details along with locker, demat account, credit cards information comes next. This is pretty standard and basic information is asked for. I happen to have memorized all of this, but for people with a lot of accounts this would be very helpful. Next section is Loans where you can record all information regarding your Property loans, auto loans, personal loans etc. I do not have any currently, but for future requirements it is a good section. The following section is a very important one, called - My Investments. Here you can jot down information on your fixed deposits, mutual funds, property, PPF, pension schemes and other investments. Personally, I think this is the most helpful section in this book, as one can really tend to be very disorganized about investments. FD's are now electronically generated, we invest in different companies or banks, hence this would really help. We're always busy in our life, working 5-6 days a week, travel and other things hardly leave us any time to maintain accounts. In such a scenario, this book saves a lot of time when one wants to just glance or quickly find information about their important details. Having all my important information at one place, in one book helps me keep myself organized. In the process of entering all the information in the book, I also managed to maintain my files and hard copies properly! Till now things were here and there. Different accounts, different email ids and the sort. Having put everything in one book gives me a better perspective on where I am placed financially, and what should be my goals ahead. Like, till now I used to just invest in fixed deposits, but now I will look at mutual funds, PPFs and some day also property. I love the red hard bound cover and how it is not very fat and very precise, hence making it thin. It is easy to fit in any drawer, bag, briefcase or purse. Very handy indeed. God forbid, but if something were to happen to me someday; this book would make it so much easier for my spouse or next in kin to figure out all my valuables, loans or anything else that they would have to take care on my behalf, or after me. Otherwise they would have a hard time searching for all the information. Internet Banking Details - Nowadays we all have our customer id and log-in details. I would like that in the bank account details. Passwords - Now this I myself am not too sure of, but if this book can be kept confidential, it would be nice to have all passwords jotted down in one place. Debit Card details - There is a section to enter credit card details but not debit, also maybe give space for more cards. I'm sure usually people have 3-4 cards at the very least. Notes - Maybe a couple of extra notes pages in-case one wants to enter some customized information as per their liking! Also, the hard copy got me thinking that to have a mobile app 'My money book' would be even better. Here what will happen is if I need to enter any information I will have to look into my book and type it. And what if I misread a number I wrote? In the app I will be able to simply copy paste details wherever I want. And of-course, the app would be password protected. Thank you for the book Exide & Blogadda! I am sure it is going to be very helpful for me!